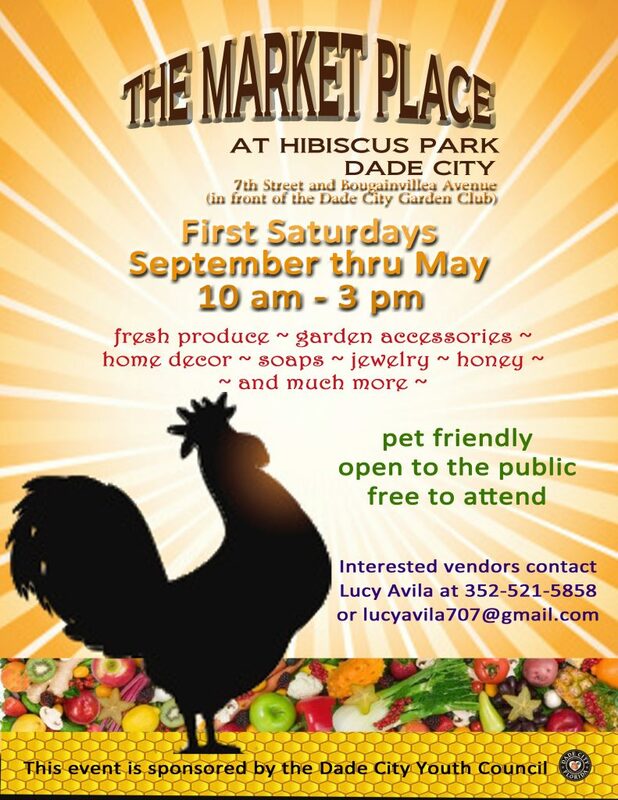 The Market Place at Hibiscus Park – Dade City, fresh produce plants garden accessories home décor furniture soaps jams arts & crafts jewelry & more! Pet Friendly Public invited to this FREE Event. SAVE THE DATE— Saturday, March 2, 2019! We invite you to join us at THE MARKET PLACE at Hibiscus Park located at 7 th Street and Bougainvillea Avenue (in front of the Dade City Garden Club) on Saturday, March 2nd from 10 am – 3 pm. The weather forecast is a beautiful day. What a great opportunity to relax in a vendor-driven environment where creative items are offered for your purchase. We have new vendors every month. We will be holding a drawing for a wonderful Gift Basket prepared by Dogs’ Day in Dade City. Come and take a chance for $1 ticket or 6 tickets for $5.00 which benefits the Dade City Youth Council. Dogs’ Day Dade City will be celebrating its 10 Year Anniversary on Saturday, March 16 th at Agnes Lamb Park from 10 am – 2 pm. Join us for lots of fun with dogs and their humans! With spring just right around the corner, we will be offering Lemongrass Spa Products and Young Living Oils, jewelry, handmade soaps, honey, wood making, wine tasting by Tropical Wines, custom pens and refills, windchimes, hand-made pottery, baked goods, cactus/succulent pots and lots more . . . please come and see for yourself! Kris Pierce will provide his special music for your enjoyment as you browse among the exciting vendors. There is just so much to experience at THE MARKET PLACE! contact Lucy Avila at 352-424-4972 or lucyavila707@gmail.com. Our great vendors are offering many unique handmade products, hard-to-find items, and vintage goods; such as local honey, home décor, garden accessories, jewelry, alpaca products made from alpaca fibers (scarves, rugs, hats, etc. ), fresh produce,handmade soaps, delicious homemade cookies and much more.